4.8 out of 5 based on 268 ratings. Dogs Playing Poker refers collectively to a series of sixteen oil paintings by C. M. Coolidge, commissioned in 1903 by Brown & Bigelow to advertise cigars. All these Dogs Playing Poker paintings in the series feature anthropomorphized dogs, but the nine in which dogs are seated around a card table have become derisively well-known in the United States as examples of mainly working-class taste in home decoration. Critic Annette Ferrara describes Dogs Playing Poker as "indelibly burned into ... the American collective-schlock subconscious ... through incessant reproduction on all manner of pop ephemera." Beautiful, original hand-painted artwork in your home. Interpreted paintings based on the masters' works of Cassius Marcellus Coolidge.This Dogs Playing Poker needs about 14 - 16days for production by a talented artist. If you're not happy with Cassius Marcellus Coolidge Dogs Playing Poker that you made on PaintingHere.com, for any reason, you can return it to us within 50 days of the order date. As soon as it arrives, we'll issue a full refund for the entire purchase price. Please note - PaintingHere.com does not reimburse the outgoing or return shipping charges unless the return is due to a defect in quality. If you want to purchase museum quality Dogs Playing Poker at discount price, why not give us a try? You will save a lot more! This Cassius Marcellus Coolidge Dogs Playing Poker needs 14 -18 days for production time frame. We ship all over the world. 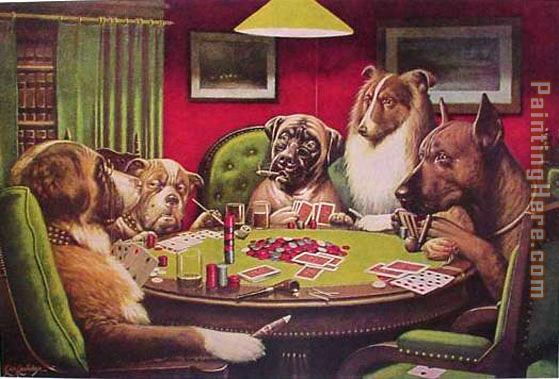 We can provide Dogs Playing Poker Painting stretched canvas and large framed art.